We feel connected to place in a story when we see it through characters’ senses. Bring senses such as sight, hearing, touch, smell and even taste (there’s edible wallpaper in Charlie and the Chocolate Factory) into your setting. Using every sense might not make sense for your book, yet it’s possible. In Roald Dahl’s children’s classic, set in a sweet factory full of wonder, it somehow makes sense even the wallpaper is delicious. When describing places in your story, think about tone and mood. Should this setting be intimidating or welcoming? Ancient, dusty and arcane or ultra-modern and spotless? What does an ancient, dusty mood smell like (old books? Damp carpets?). Use the ‘Core Setting’ section of your story dashboard on Now Novel to brainstorm descriptive elements and create more detailed settings. Atwood uses sound and smell to paint an idea of the strangeness of being a child in an adult’s world. She uses the young Cordelia’s senses to create place and this puts us in the scene, as we experience young Cordelia’s surrounds through her perspective. ‘Time’ is an important aspect of setting. This is particularly so in historical fiction. Details from the types of buildings and shops that line the main road of a city to individual details of people’s clothing and speech contribute to a sense of when the story happens. 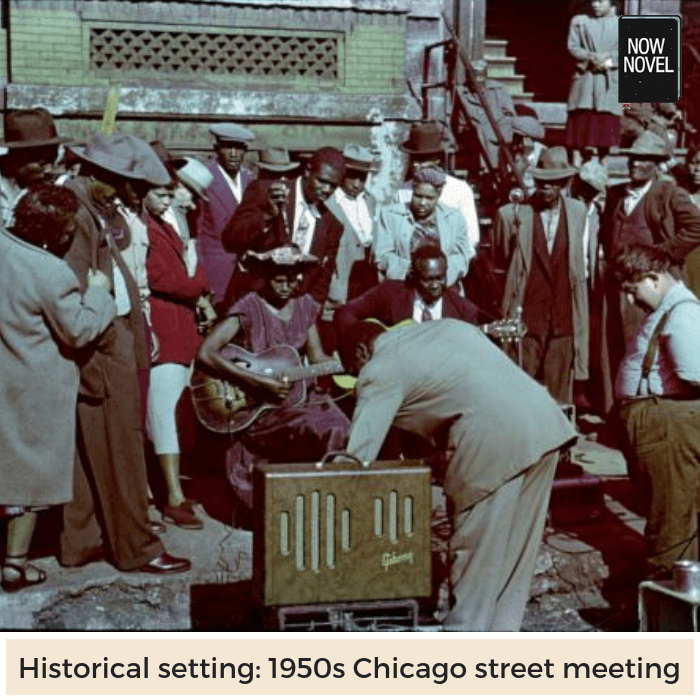 A story set in 1950s Chicago will naturally have very different buildings, cars, and people, than one set in the late 2000s. How do you describe a place so the reader can sense the time period? Include current interests, challenges or obstacles: In the time period of your story, what are the hot topics of the day? Are people worried about a war, a new law, a change in government? The details here convey a sense of rural life in 18th Century Scotland. Descriptions of herding sheep and rival runners create a sense of an agrarian, outdoor way of life conjuring earlier, less modern times. Mr. Anderson collected a fine heap of coins and Will for his part got a gray cloth coat and a pair of hose. The reference to hose, which men don’t typically wear in modern times, further places the story in earlier times. In addition to creating the broader sense of time or period, you can use small-scale time (such as time of day or the way place changes week to week or month to month). Think of how time of day and physical changes to a place in time can both contribute tone and mood. For example, if a city is bombed over a week’s period in a story, what does it look like at the start versus at the end? As an exercise, describe a sleek, modern city in a few sentences. Then describe the same elements of the city after a week of civil warfare. What has changed and what mood do these changes create? Langour and laziness: The golden light of a late afternoon outdoor social gathering, for example</li. Weaving in details of time of day as well as the way places change over a day, week, month or year will create a sense of your setting being a dynamic, active and real place. Carey weaves a succession of nightly events together to show the frustrations of Oscar’s father. This use of time, coupled with the stormy setting, creates tension. When the father asks Oscar’s mother where the fuse-wire is, she says ‘I used it…to make the Advent wreath’ [for the church]. Oscar’s father’s response is to blaspheme. The mother, being devout, makes them all kneel to ask God’s forgiveness. We stayed there kneeling on the hard lino floor. My brother was crying softly. Then the lights came on. Carey masterfully uses a tense nighttime setting and situation (lights going out in a storm) to show different family members’ personalities. The mother’s response is to turn to her faith, the father’s to think of practical matters like finding fuse-wires to fix the lights. The stormy nighttime setting provides a dramatic backdrop to the action, giving both the cause for the situation and the mood of the scene. Story settings affect and alter characters’ moods and states of mind, just as places affect our own. Learning how to describe a place thus means, in part, learning how to describe places so that they reveal characters’ desires, interests, fears and more. Bring your character’s personalities, passions and histories to bear on the setting details they notice and describe. This is the opening to Toni Morrison’s Beloved (1987), describing the haunted quality of her protagonist Sethe’s family home. Morrison immediately creates a sense of feeling in her setting description. Describing her characters as ‘victims’ of the house makes it clear it is a place of trauma and suffering. Morrison lists interesting, mysterious details about the haunted air of 124, and the different details of place that are the final straws for individual members of Sethe’s family. Overall, the effect of her place description is to create a sense of hostility and ‘unhomeliness’. We have a clear sense of the emotions place produces or reawakens. The cons of detailed description are that it can slow narrative pace and clutter your prose. Being too broad and abstract has its own cons, however. If you describe a high street, for example, and say ‘The shops all have lavish window displays’, we don’t see any difference between them. It’s often best to balance a little relevant detail here and there with broad description elsewhere to give both the specific qualities and the general feeling of a place. What is relevant setting description? In his novel Love in the Time of Cholera (1985), Gabriel Garcia Marquez describes Dr. Juvenal Urbino as one of the most respected men in the Carribean town where the story takes place. Find adjectives that convey these qualities in a way that make place more specific. ‘Venerable’, for example, suggests respect that comes with age as described above. ‘Decrepit’, by contrast, suggests falling apart and ugly with age. This entry was posted in ebook, Publishing and tagged Daily Writing Tips, editing tips, time management, time travel, tips, Writers Write, writing career, writing goals, writing tips, writing tools on November 21, 2018 by First Edition Design Publishing.